Fall is here finally, and I am in the mood to cook and entertain again. So here is a salad I made last night for supper. I love it because it is so quick, easy, and a crowd pleaser. Arrange avocado slices on a plate. 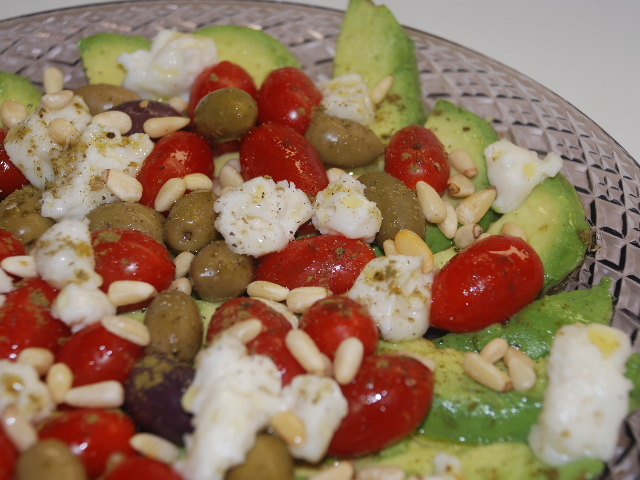 Sprinkle grape tomatoes, olives, cheese, and pinenuts on top. Add salt and pepper to taste. Sprinkle hyssop powder on top. Pour lemon juice and olive oil over all. Serves 4-5.